The Pentagon’s Inspector General discovered nearly half of U.S. military bases abroad lack offices where troops can register to vote or apply for absentee ballots. 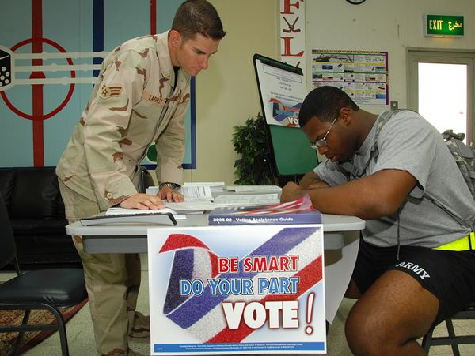 The Pentagon’s report notes the Military and Overseas Voter Empowerment (MOVE) Act, which President Barack Obama signed into law in 2009, requires an installation voting assistance office (IVAO) on every military base that is not in a war zone. The Pentagon attempted to contact the offices at 229 military bases, but could only reach 114 IVAOs. Republicans have accused the the Obama administration, which just recently sued to make it more difficult for military voters to vote in Ohio, of not doing all that it could to implement the voter-assistance offices because military voters tend to vote for Republicans. The Military Voter Protection Project last month discovered military requests for absentee ballots were lower in swing states like Florida than they were in 2008. For instance, the report found 37,953 service members had requested absentee ballots this year in Florida, compared with 86,926 in 2008. In Virginia, 1,746 service members had requested ballots, compared with 20,738 in 2008. “We concluded the Services had not established all the IVAOs as intended by the MOVE Act because, among other issues, the funding was not available,” the report said, noting that Pentagon officials have estimated costs would exceed $15-20 per year to establish the voting-assistance offices.